Video phone calls are ideal when you want to see someone while you’re talking. The larger screens help you see more clearly. At the same time, many phone callers enjoy being mobile, so they can make or take calls when they like. Others enjoy relaxing in a couch or easy chair during calls, which may not be as easy while using a typical desktop PC. Also, like a Goldilocks story, Smartphone screens are too small, Desktop screens big enough yet not mobile enough, and tablets are just right. 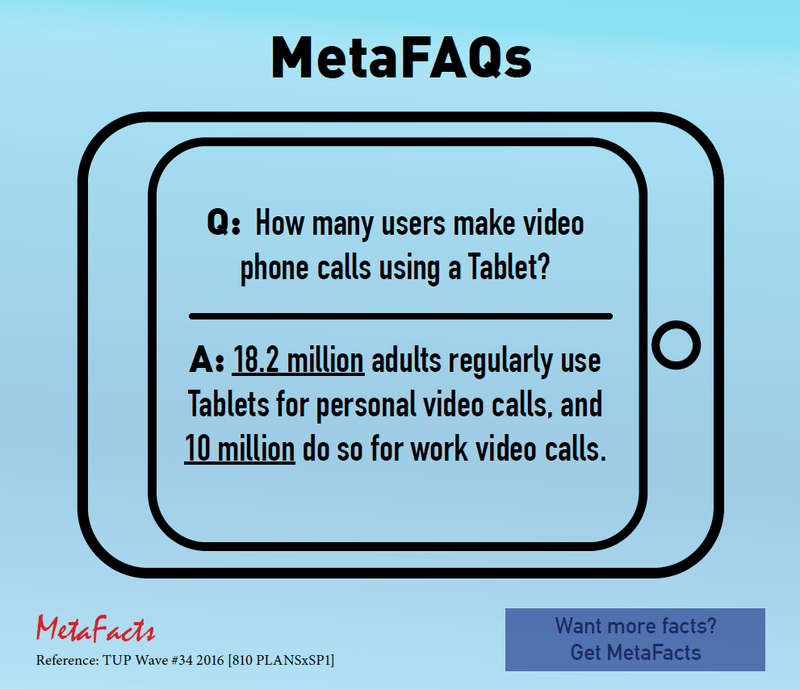 That’s at least part of the calculus for the 18.2 million adults who regularly make personal video phone calls using a Tablet, and 10 million who do so for work video calls. This brief MetaFAQs is a quick glimpse at current research findings of interest. In addition to profiling the voice and written communication activities of Tablet users, many other related answers are part of the TUP service, available to paid subscribers. One section of TUP 2016 which includes extensive results about Tablets is the TUP 2016 Tablet chapter. This is one of more than a dozen chapters in the entire TUP 2016 study. Households with at least one Apple PC have convenience items from single billing by using one service for phone, TV and internet to utilizing Video on Demand and conferencing with Webcam.